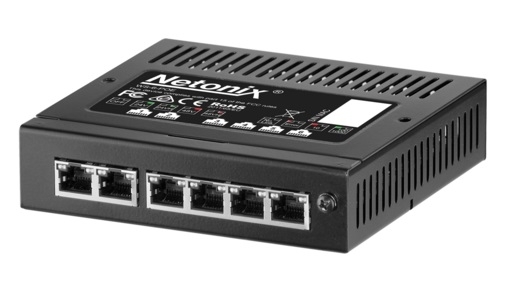 The Netonix® WISP Gigabit POE Switch model WS-6-MINI was designed specifically for the WISP industry with a rugged chassis and extended operating temperature range. It features a simple yet powerful user interface providing the software features WISPs need in a switch. 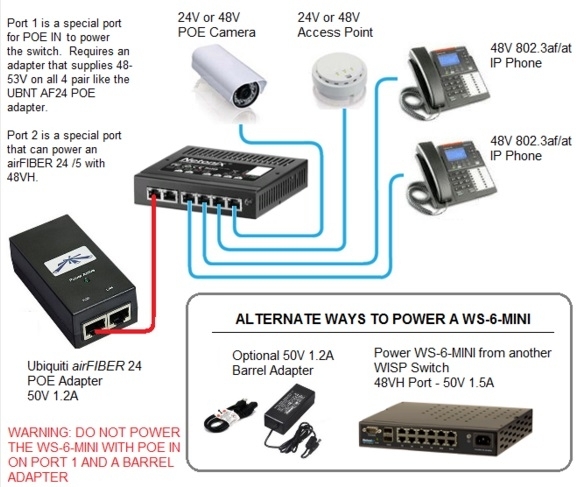 The WISP Switch™ features the ability to power many popular 24V, 48V/50V passive PoE devices from many manufacturers including the Ubiquiti Networks® airMAX™, UniFi™, SAF™, MIMOSA™, Ligowave™, and airFIBER™ product lines. Highest density of PASSIVE POE ports per cubic inch on the market for those small equipment boxes. The only switch line on the market that can deliver 1.5A of 24V or 48V on all 4 pairs (24VH and 48VH). The only switch line on the market that has current sensors on all passive POE ports. 48VH 1.5A passive POE port from another WISP Switch. injector used to power an airFIBER 24 GHz. that only supplies 48V power on 2 pairs. port 1 has no POE options, it is just a standard Ethernet port. sure to connect the ground screw to Earth Ground for ESD protection.